ProgressiveEnviro.com Works With Your Specs! ProgressiveEnviro.com brings 40 plus years of experience in designing, maintaining and servicing water and waste water treatment and filtration systems for cooling towers, boilers, heat exchangers, and irrigation systems. We offer traditional ion-exchange water softeners and chemical systems and also salt-free, chemical-free technologies for the treatment of scale, solids, sediment, algae, Legionella, and bacteria. We are experienced in potable water treatment including reverse osmosis, ultrafiltration and deionization. 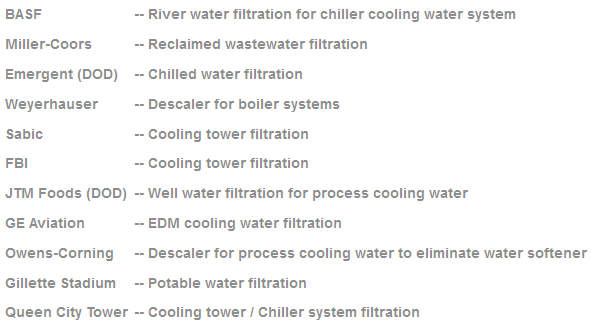 We are cutting edge in the fields of cooling tower blowdown water reclaim, wastewater reclaim, rain water harvesting and other water efficient sustainable systems and methods. We design, sell and service complete water and wastewater reclaim systems and components. Meet your corporate sustainability goals. Lower your salt and chemical usage as well as provide maintenance-free filtration. Eliminate disposables and lower your carbon footprint. Let ProgressiveEnviro.com know about your project. Use our project quote form link and we will respond promptly. Increasing environmental regulations and increased costs have prompted many companies to recycle their use of process water, as well as decrease the chemical treatment of water and wastewater. Recycling of used process water is a popular way to minimize the discharge of harmful pollutants into the eco-system and lower costs. ProgressiveEnviro provides many different water and waste water treatment and filtration system solutions. ProgressiveEnviro.com can design new or service existing water treatment systems, non chemical water treatment systems, well water treatment systems, industrial or commercial water treatment systems, hard water removal systems, electronic or electric water treatment systems, cooling water treatment systems, food and beverage commercial and industrial water treatment systems, cooling tower and cooling water treatment systems, plastic injection molding water treatment systems, metal and chemical water treatment, legionella water treatment removal systems and more. We operate in Ohio (OH), New York (NY), Massachusetts (MA), Connecticut (CT), Rhode Island (RI), Pennsylvania (PA), West Virginia (WV), Kentucky (KY), Indiana (IN), Illinois (IL), Michigan (Mi), North Carolina (NC), South Carolina (SC), Georgia (GA), Alabama (AL), Tennessee (TN), Florida (Fl), and Texas (TX).